"The balloons were FANTASTIC! Thanks so much!!!" "Just wanted to say a huge thank you for all your hard work in helping to make our wedding venue look absolutely stunning! The balloons looked amazing and survived the whole night!" "Thanks for the wonderful balloon display - it looked amazing"
"We are really delighted with the excellent service that we have received from Air Flair, the range of balloons, flexibility of options, very professional communication throughout the ordering & confirmation process & the delivery & setting up. The balloons were absolutely gorgeous & create such an exciting & marvellous atmosphere for a party - Air Flair were instrumental in the success of our family garden party - we have no hesitation in using you again for any future events & recommending your service". "Just an email to say thank you for helping to make our day fantastic last Friday despite the bad weather. I cannot thank you enough for helping make our day perfect. The balloons were wonderful"
"Thank you for providing the balloons for our Christmas Party, the kids especially loved them and even took them home!" "Just to say a massive "Thank You" for the fab balloons you supplied for Luke's 21st Birthday Party meal!! They were fantastic! The effect of the tables of black and cream made a very classy impression and a great talking point!!!" "Thank you so much. They look amazing!! My sister said how lovely they are and Jacob's a very happy little boy. Thanks for your help, such wonderful service"
"Thank you so much for the beautiful balloons for Claire & Russell's wedding. They looked fantastic and loads of people said how fab they were"
"I just wanted to thank you for your great service and fantastic balloons. Our event went really well and everyone especially loved the balloons :)"
"Thank you for the balloons, they were perfect, just what I wanted. I even managed to get them home in a taxi without bursting any!" "Thanks for the great service as always!" "I can recommend Air Flair for any occasion, professional and good value"
"If every business person I had to deal with during planning our wedding was as helpful as you, wedding planning would be easy!!!" "Thank you so much for all your help! The balloons were perfect!! Would definitely advise anyone to use you for any event"
"Love them thank you, perfect colour!" "Just wanted to say thank you for the lovely balloons!! They really finished the room off well! And the kids loved playing with them at the end of the night!" "Absolutely fantastic communication and customer service. Very friendly and personal. Nothing seemed too much. Excellent - thank you!" "We were blown away by your decorations, it made for the wow factor and our party was brilliant made all the more special by yourselves. Thank you." "Absolutely gorgeous balloons thank you, and so helpful!" "Highly recommend Air Flair! Balloons were fantastic!" "A wonderful professional service, thank you"
"The balloons were fantastic and the bunch of hearts has only just gone down!!! Thanks for making our special occasions even more special and memorable"
"Balloons and service were absolutely fantastic, thank you so much"
"I cannot thank you enough for the amazing balloons you provided for my son's 3rd birthday party today. The giant Fireman Sam was unlike anything I had seen before and was the talking point of the party. It is now sat proudly in my son's bedroom. The service I received off you was second to none - excellent communication, pricing and your personal interpretation of what I described translated into balloon sculptures was incredibly unique. Thank you once again"
"Beautiful, well made displays and a friendly service. Thank you so much." "The service and help I got from Air Flair was excellent. They provided balloons for our wedding that exceeded our expectations. Highly recommended"
"Would like to say a BIG thank you to Kate for the spectacular display of balloons for my daughters 21st birthday party. She has been an absolute pleasure to deal with and I would certainly recommend Air Flair for their professional and organised approach. Everyone commented on the amazing flowers and champagne bottle display and as can see from the photographs it certainly made the room look amazing. Hope we have another occasion to use you again soon!!!!!!!!" "Thank you so much - they are fab"
"Thank you Air Flair for making a special little boy's 2nd birthday celebration really special"
"Fantastic light sabers, thank you Air Flair"
"Just want to thank you for doing such a nice job yesterday at Tern Hill for our wedding. The room looked lovely and we had a wonderful day. Thank you for helping to make our day so special"
"Thanks for the lovely balloon arrangements for my sister's birthday! Just what we wanted, there waiting for us at the venue; it couldn't have been easier!" "Fantastic service. The room decorations were beautiful. Very professional and extremely friendly. First class. Many thanks for making the occasion special"
"Big thank you Air Flair for Joseph's amazing balloons, he absolutely loved them"
"We knew you were the right person for the job based on the numerous positive recommendations we got from everyone in Bayston Hill. It was refreshing dealing with someone who knew EXACTLY what I wanted and gave me the appropriate advice. The end result was stunning and we are very happy. We will be using Air Flair again and I think we've found a firm family staple! All our thanks." "Amazing giraffe made for my sister who is due her first baby. Very happy with the result"
"Amazing balloons delivered to my daughters birthday party! Would highly recommend!" "I just wanted to drop you a line to tell you our little event here at Preston Montford went extremely well. Some of it was down to you being able to supply us with party goodies at such short notice, without doubt the retirement event would not have had such an impact without your help and support. We look forward to doing business again soon. Thank you once again." "Can't say how many people have said how much they loved the balloons at the party as so did I, thank you for doing such a great job. I really can't fault anything you were just great all the way through"
"Very efficient and good communication"
"Amazing wedding balloons - clever Air Flair! The photo doesn't do it justice, they looked even better in real life"
"Excellent Service, design was exactly what I was looking for and was a great talking point at the party"
"Kate is enthusiastic and takes care to deliver the very best. 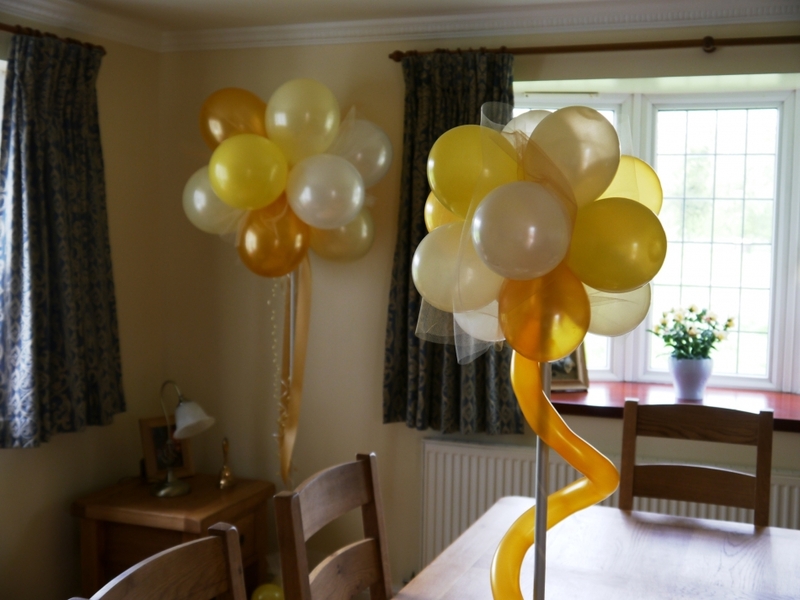 We have been so pleased with the displays she has done for us"
"Absolutely delighted with the beautiful balloon bouquet for my friend's retirement party. Just perfect. She can keep it for so much longer than fresh flowers. Thank you for your care and attention to detail"
Thank you so much for the decorations you did. © 2019 Air Flair. All Rights Reserved.